45 So also it is written, “The first man, Adam, became a living soul.” The last Adam became a life-giving spirit. 46 However, the spiritual is not first, but the natural; then the spiritual. 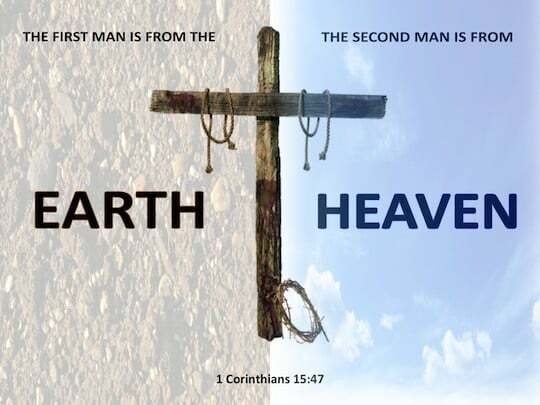 47 The first man is from the earth, earthy; the second man (which God is NOT! – Numbers 23:19; Hosea 11:9) is from heaven (came from God). Let’s not get this phrase twisted. This passage contains several metaphors. The Lord Jesus is the called the last Adam and the Second Man in this portion of writing. These two titles of Jesus compare Jesus with Adam. Yet most Christians understand that this statement is not literally true because Jesus name was never Adam nor was He literally the second man after Adam (Gen 4:1). However, it is a correct metaphor presentation of Christ. The First Man and The Second Man! We also call God our Father for the same reason: (John 20:12) Because God created man (God did not birth man, yet it was God who caused the embryo within a virgin to start developing) in God’s image (Gen 1:27). The “Spirit” Jesus had with him, and in him, (in addition to his human spirit) was that of God his father (his creator). 49 And just as we have borne the image of the earthy, so will we also bear the image of the heavenly (2Peter 1:4). 50 Now I say this brothers: that flesh and blood cannot inherit the Kingdom of God; neither does corruption inherit incorruption.